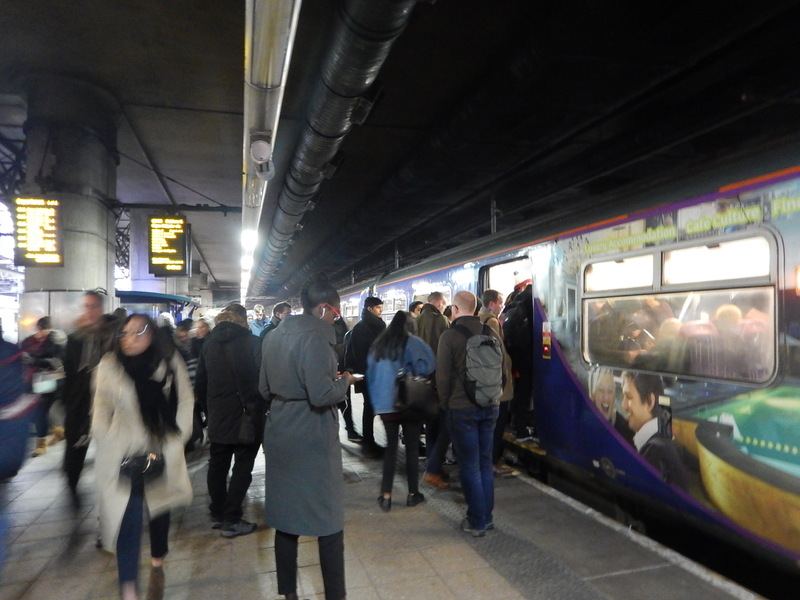 I caught the first morning train from Manchester Victoria station across the Ordsall Chord to Manchester Oxford station, where after buying hot chocolate, I took the same diesel multiple unit back to Hebden Bridge station. A few points about the Ordsall Cord and its effects. It was only the second weekday of this Ordsall Chord service, but what surprised me was that quite a few of the early travellers went to the extra two added stations on the service. This bodes well for the future in that when Piccadilly and the Airport are added, the passengers will surely travel. The station may have improved in recent years, since the new roof, better tram access and more retail facilities have been added, but it is still a rather poor station for passengers to walk around, compared to others with similar amounts of trains. I took this picture as the train before mine unloaded passengers at Victoria station. It is the typical scrum that you get at busy stations in the North. The Ordsall Chord will affect Victoria in the following ways. There will be more trains passing through. This will increase the number of passengers entering and leaving the station. Passengers will change trains but not platforms at Victoria. This will mean that passengers will regularly wait for 15-30 minutes on the platform. Ideally services like Liverpool to Leeds and Newcastle, should have same or cross platform interchange with local services using the Ordsall Chord. The Ordsall Chord is currently served by Plstforms 5 and 6. These platforms are totally inadequate for the extra numbers of passengers and especially the extra passengers, who will wait on the platform, whilst changing trains. A coffee kiosk is needed on both Ordsall platforms. The platforms are not wide enough. There are not enough seats. Both platforms are used to terminate services, which is totally against the philosophy of the Ordsall Chord. This must and hopefully will stop. Ideally, Ordsall Chord services and important cross-Manchester services should have a platform layout, that means as many changes as possible are level. Take the case of the elderly passenger with their presents in a bulky case going from say Liverpool to perhaps Rochdale for Christmas. They will not want to negotiate the bridge at Victoria, even by lift to change trains. And neither will staff. But a cross or same platform interchange would be ideal for everyone. The layout would all depend on how many services are going through the station.. Currently, the station has the following services. Three tph cross-Manchester services stopping at the station. If these services could be simplified by joining East and West services back-to-back, we are looking at perhaps ten tph. As there are many stations in London that handle fourteen to sixteen tph on two platforms, the following would surely be possible. Use one platform for all Westbound cross-Manchester and Ordsall Chord services. Use one platform for all Eastbound cross-Manchester and Ordsall Chord services. Platform 5 and 6 would not be ideal for this, as the services should be on either side of a wide island platform, to allow passengers to reverse direction without changing level. I know it was early in the morning, but the picture shows how dark and dingy the station still is. Surely, just on the grounds of Health and Safety, the lighting levels must be improved. Surely, if the rebuilt Reading and Leeds stations can have escalators for their overbridges, then the equally important. but smaller Manchester Victoria, should have some on the busy overbridge. Did people get off the train at Deansgate station to use the Metrolink? Changing from train to tram at Victoria, involves a fight through crowds to get up the stairs to the bridge and then another another set of stairs to get to the Metrolink. But at Deansgate station coming from Victoria, it is just a level walk across to the major Deansgate-Castlefield Metrolink interchange. It would appear that 2015 redevelopment of the tram stop and its link to the station were designed for the extra passengers, that the Ordsall Chord will surely bring. Deansgate-Castlefield with its three platforms, also has a comprehensive list of services. And these are just the Off Peak, before the important Trafford Park Line opens in 2021. Manchester Piccadilly station is one of my least favourite stations in the UK for using the trains. I always travel to and from Manchester in Standard Class, to avoid the crowded walk up and down the platform at Piccadilly. I know there’s a bridge at the London end of the train, but it is not directly connected to the Metrolink underneath. Buying a ticket for the Metrolink is a tiresome business, when I should just be able to touch in and out with my bank card. The forecourt of the station is always crowded. Only the above average food offerings for a coeliac give me any cheer. Hopefully, when the services across the Ordsall Chord are fully developed, a lot of places I want to go will be available by changing trains at Crewe or Stockport. In some ways the nearest London has to the Ordsall Chord is the railway across the South Bank connecting London Bridge, Blackfriars, Waterloo East and Charing Cross stations, which carries in excess of twelve tph. It appears to me and staff I have talked to, that passengers are using this route between Westminster and London Bridge, instead of the Jubilee Line. Especially, if they have bicycles! Will Mancunians use the frequent service on the Ordsall Chord across the city, as a Third City Crossing? 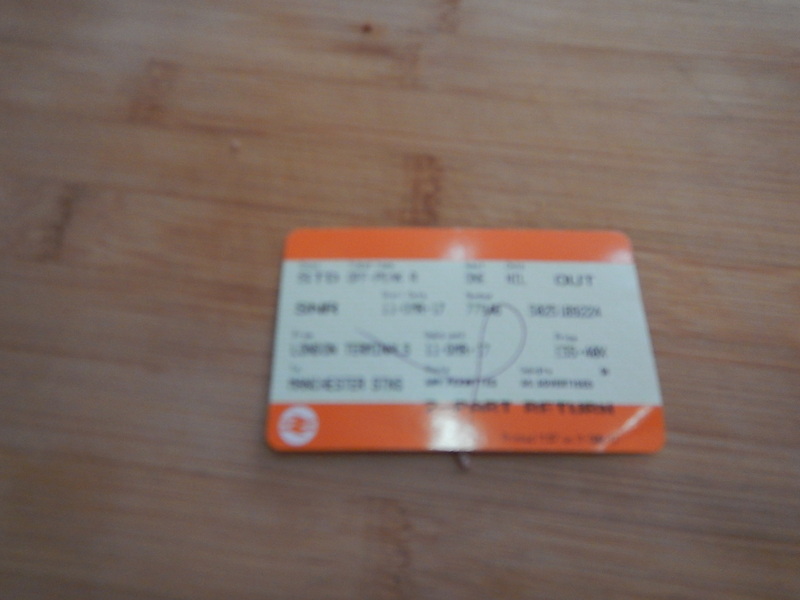 My ticket to Manchester from Euston was to Manchester Stns, which means i can get out at Deansgate, Oxford Road, Piccadilly or Victoria. Surely, it should include Salford Central station. In my trip, I went across the Orsall Chord four times. Each time, the train waited a minute or so before proceeding over the bridge. Were there signalling issues, the trains were not quite to time or were the drivers just being cautious. Now that the difficult phase is complete, it will be interesting to see how the swervices build up. All the Metrolink “lines” have a 12 minute service, but the layout and overlap means that Altrincham, Bury, East Didsbury, Etihad Campus, Harbour City and Shaw & Crompton get ten trams per hour. The Airport line is supposed to run to Victoria, but currently stops short at Deansgate Castlefield until next year, however still a theoretical 35 trams and hour between there and Cornbrook. Considerable congestion between Deansgate Castlefield and St. Peter’s Square (noticed queueing inbound well into the evening from Cloud 23 last night. “Manchester Stations” should IMO include Salford Central and Salford Crescent. Signallers have been utilising the chord poorly – long [scheduled] waits at Victoria, fast trains or terminating trains put behind slow ones, trains sat on the chord for ten minutes and so on. Considering there only about a dozens trains a day each way its start up is pretty poor. It’s all 30mph on the city centre rail lines, so little stress for the drivers. OTOH I have spotted them using the two way working on the inner line (both a bi-directionally signalled). Somewhere it said TPE and other TOC’s were awaiting the new “electric timetable” before fully utilising the chord. Surely when there are perhaps four tph going through Deansgate to the Airport, people will take the train. Or they will if the tickerting is just touch in and go with a bank card. The same delay happened in London, when Southeastern were using Waterloo. I suspect there might be rules to play safe. Will they be putting Automatic Train Operation on the Chord, like Thameslink and Crossrail? The theoretical limit on the Ordsall Chord is probably 24 tph, although there aren’t the places to sustain that sort of service. But I wouldn’t be surprised to see 4 tph cross-city routes, like the London Overground, Merseyrail, Newcastle Metro and Birmingham.